2019 Yamaha VX Cruiser HO CONQUER WATER The VX Cruiser HO combines power and style into one value-packed platform that delivers excitement. That's not say that this little beast doesn't have a tame side with luxury features like Yamaha's signature Cruiser® seat, Cruise Assist and No Wake Mode functions. RIDE TECHNOLOGY The world's first dual handlebar throttle control system is easy and intuitive. Pull the right lever to go forward, and the left lever for reverse. Pull them both, or in any combination, and the system reacts with precise control. CRUISER SEAT The theatre-style three-person Cruiser Seat features double top stitching designed to provide plush accommodations for all-day touring. NANOXCEL Incredibly strong, yet ultra lightweight, the innovative NanoXcel® hull delivers an impressive power-to-weight ratio, agile ride and industry-leading fuel efficiency. 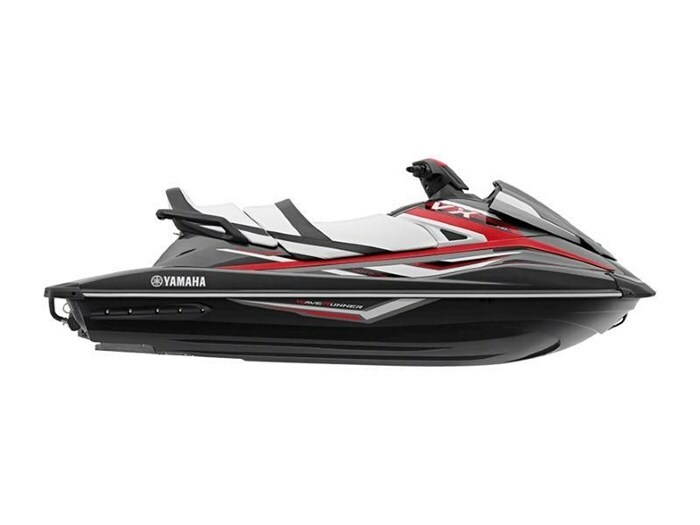 Features may include: POWERPLANT The VX Cruiser HO is powered by Yamaha's 1812cc, high output engine which is the largest displacement engine in the PWC industry. This new generation of power balances high performance, economy, environmental awareness and the reliability Yamaha is famous for. Electronic Fuel Injection (EFI): Delivers a smooth, high power output with low fuel consumption and low exhaust emissions. JET PUMP PROPULSION SYSTEM The VX pump design is one of the most efficient pump configuration ever, increasing stream velocity and thrust while decreasing cavitation and prop spin. RiDE (Reverse with Intuitive Deceleration Electronics) - The world's first dual handlebar throttle control system is easy and intuitive. Pull the right lever to go forward, and the left lever for reverse. Pull them both, or in any combination, and the system reacts with precise control. Benefits include better handling, smooth deceleration and more control while turning. ULTRA-LIGHTWEIGHT, HIGH STRENGTH HULL AND DECK The VX hull is designed to be light and strong. Progressive, Stepper Draft V-Hull with Integrated Bow Spray Guard: Provides excellent maneuverability, handling and comfort.